When it comes to home renovation and improvement, adding a patio door is one of the jobs that many homeowners choose to do because a big “picture window” can bring about such a dramatic change in the way a room looks and functions. Of the different materials that can be used to manufacture patio doors, uPVC stands out as one of the more versatile and cost effective to use. The use of uPVC patio doors has brought unlimited design options that make it possible for a homeowner to have a unique house that suits their style. If you are a homeowner looking to have a patio door installed then you are in luck, this piece will walk you through everything you need to know about how to pick and install the perfect patio door on your property. What are the advantages of uPVC patio doors? UPVC patio doors are designed to retain the heat in your home as well as prevent outside temperatures from affecting the interior. This insulation quality allows you to cut your energy costs. The majority of any patio door is going to be glass, but the frames themselves are very important in terms of how they deal with heat transfer. 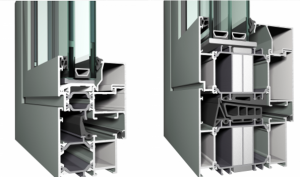 uPVC patio door frame profiles are internally chambered, almost like a honeycomb, and this has 3 benefits 1) it has an impact on reducing heat transfer, 2) it adds strength, 3) is serves as a channel to house galvanised steel reinforcing. This vinyl based material is also a good natural insulator. The uPVC itself is a very poor conductor of heat, unlike aluminium which is a very good conductor of heat. Timber is also a natural insulator, but timber frames can’t be chambered or have steel reinforcing. As a big part of how uPVC patio doors manage heat transfer is the glazing. The whole idea of a patio door is to bring in in light and open up the field of view, hence you have a big proportion of the doors as glass. By using 20mm sealed units with argon gas filling you can maximise the insulation qualities of the door in terms of heat (and cold) convection, both inwards and outwards. UPVC patio doors can help with sound qualities of your home on 2 fronts. 1) the chambered nature of the frames has a small deadening effect on sound transfer, but the biggest aid in sound reduction will be gained by use of good quality double, or triple glazing. The sealed Triple and double glazed units used for uPVC patio doors are, as we all know, made from a sandwich of 2 (or 3) sheets of glass separated by a gap. What you choose to have inside this gap can have a major effect on sound reduction, and insulation as we covered above. A partial, or full, vacuum will deaden or stop sound transfer. It is not possible for sound to travel in a vacuum, and a partial vacuum will also make it more difficult. Therefore, both solutions will reduce noise transfer. Modern designs also make use of heave inert gasses such as Argon or Xenon, these are very dense gasses. As sound relies on the movement of the atmosphere to travel, if you make the atmosphere heavy and slow to move, it also interferes with sound transmission. Hence, Argon filled sealed units will give you a quieter home. The gas filled unit has the benefit of also making heat convection very difficult, and so using a gas filled unit has a 2-fold improvement value. Multi-point locking systems are pretty much standard on uPVC patio doors. Locks that engage on several points around the frames mean the doors are very secure when locked. The “claw-like” nature of the locks in that they hook into the frames means it’s extraordinarily difficult, even impossible under normal circumstances to lever them out of the frames once the doors are locked. You also have “3 or 5 lever” cylinder key operated locks that are drill, bump and snap proof. In terms of the frames, galvanised steel reinforcing makes them very strong and resistant to brute force attack. Glazing for a full height glazed patio door will be tempered, toughened safety glass. When used in a double glazed unit, it becomes very difficult to break without an enormous amount of brute force. Since patio doors are always in contact with exterior weather elements, it is important that they have resistance properties. UPVC patio doors are naturally resistant to inclement weather elements, obviously vinyl does not rust or corrode like metal (aluminium) or bio-degrade like timber. Practically impervious to most atmospheric pollutants, for all practical purposes uPVC is inert and non-reactive. UPVC requires very minimum maintenance, in fact, uPVC patio doors can go for many years before maintenance work is required on them. Just take the time to keep the glass and frames clean, and light lubrication of the moving parts should be enough to get decades of trouble free use from your doors. Personalising your door design is something easily achieved with the latest uPVC products. 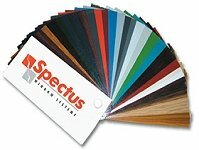 Modern manufacturing techniques now allow for coloured and textured uPVC profiles in around 20 colours for “foiled finishes and even more for RAL spray coats. Foiled finishes are specially heat bonded coatings applied to the surface of the uPVC during manufacture. It’s not like a spray paint surface, it is actually chemically bonded to the uPVC and therefore, unlike a spray painted finish, peel & crack proof. Not only can you choose your colour, you can also add a wooden textured surface to the profiles, that recreates the look & feel of a wooden window or door. What are the most popular uPVC patio doors designs? The combination of design choices is quite wide when it comes to patio doors made from uPVC. There are a lot of options to choose from and all of them can be customised to meet your style and needs. French doors comprise of two doors fixed on opposite sides of a single frame. Effectively two doors side by side. They mostly open outwards and when they come together and close, they lock in the middle. They offer a lot of style and character to a home and are mostly loved by homeowners who have an affinity for classic design that is not going to go out of fashion any time soon. 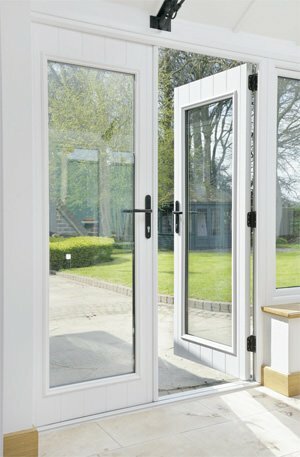 Sizes of UPVC French Patio doors run from 900-1900 mm wide by 2100 to 2200 high. Over the width of around 1900 – 2000mm you are going to need to fit side panels. Bifold doors are made of separate leaves’ that fold and slide along a rail. When opened the leaves come together at one end of the doorway and provide a wide entrance. They are slightly more expensive than French doors but are very popular for homes with wide patio door requirements. Pocket doors are similar to bifold doors, their biggest difference lies in the track rail and how they open. They essentially slide into a wall cavity and “disappear” when opened. These doors are much more expensive than most designs and are very rarely used as an external door. Sliding doors feature large glass panels, they are fitted to slide on a rail track. 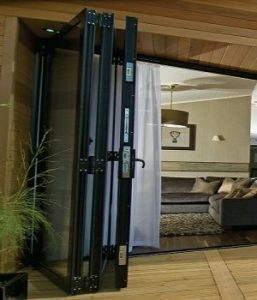 But unlike bifold doors which move completely to the side and stack out of the way, sliding patio doors only move within the frame. For a small opening, this design can restrict the clear opening space. The average height of a uPVC sliding patio door will be between 2100 & 2200 mm. An unusual feature is the key to this design, effectively an inline sliding patio door, but where one of the doors can also be opened like an awning window, in that it can lean backwards, or tilt, into the room. The amount of tilt is limited mechanically for both safety & security reasons.